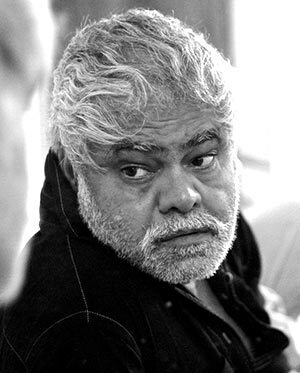 If you flip through the Hindi film channels on your television, you will definitely stumble upon a film starring Sanjay Mishra. "I sign small films for rehearsals -- and I get paid for them!” Mishra explains. “I always say with pride that I do my rehearsals with the producer’s money. It’s much better than rehearsing in front of a mirror. “Besides, I get to go to new places for free. For Miss Tanakpur Hazir Ho, I got to see western Uttar Pradesh, and learn its language. For Masaan, I went back to Benaras, where I grew up. I stayed in a small room, away from the unit, by the Ganga river. I travelled to the location by boat. My ‘makeup’ would be a dip in the Ganga! That kind of life is such an experience. But we’re getting ahead of ourselves. Let’s start with who Sanjay Mishra really is. Sanjay Mishra, 51, loves to cook and listen to Pink Floyd. Okay, let’s rewind some more. "I belong to a family of government servants,” says Mishra. His father worked in the information and broadcasting ministry, his grandfather was a district magistrate. But it was his grandmother who was his earliest influence. She used to sing for the Patna radio station and Mishra spent his childhood vacations with her. All his relatives would gather around and having singing sessions and Mishra would join them. At age nine, Mishra shifted to Benaras. “My father was deeply interested in the arts. We would have a lot of visitors at our home who would read, play the sitar and other music. This influenced me and I wanted to do something on those lines. I used to get stressed out with studies. I couldn’t remember dates. I flunked Class X twice and my father was very tense about my future,” he says. Then, he heard about the National School of Drama and decided to try it out. Irrfan was in his final year at NSD at the time and impressed Mishra with his plays. Irrfan’s wife, Sutapa, was an actress there as well. The two talented actors would go on to work together in movies like Charas and Krazzy 4. Mishra’s next stop was Mumbai. This, he insists, was not his struggle period. “I was learning all this time. These experiences helped me in Ankhon Dekhi,” Mishra said, referring to his brilliant 2013 film, which won him many awards. Many of you, though, may not remember him in his first film, O Darling Yeh Hai India (1995). “I really looked up to Ketan Mehta after his film, Mirch Masala. I wanted to be around him. Whether he gave me a job or not was secondary. I thought I would at least know something about my favourite director -- how he thinks, how he operates. He gave me a role in O Darling Yeh Hai India,” Mishra says. 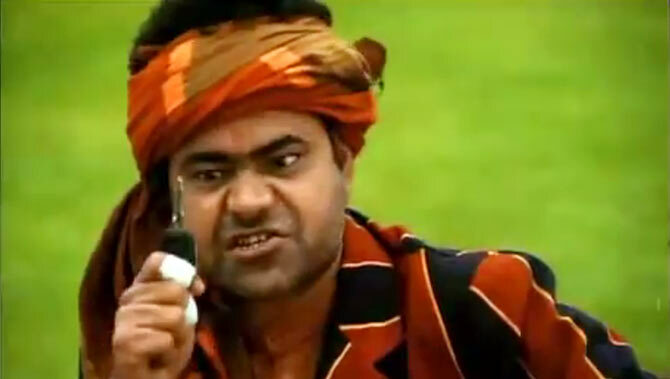 During the cricket World Cup series in 1999, Mishra’s Apple Singh commercials for ESPN Star Sports became so popular that the character was adopted as the face of the channel. Then he signed up the hugely popular sitcom Office Office, with Pankaj Kapur, Manoj Pahwa and writer Ashwini Dheer. Though it was Kapur, as Mussadi Lal, who stole the show, the limelight also shone on the talented supporting cast, including the don’t-care-less, corrupt, soaked in red-tapism bureaucrat, Shukla, played by Mishra. Sanjay Mishra has enjoyed working for all his movies. “People say critics are bad but, whichever film I did, critics would always mention me in their reviews and praise me. Slowly, people started noticing me,” he says. 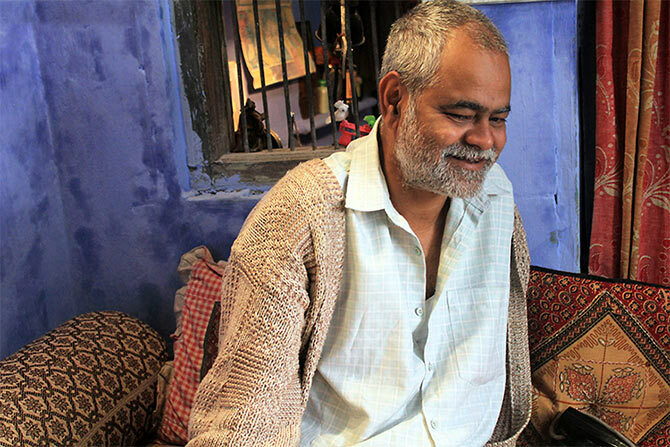 Mishra saw a theatre-goer in tears after watching Ankhon Dekhi and was surprised. “I didn’t know it would touch someone so much. Itna serious kaam ho gaya kya galti se (Did I manage to accidentally do such a good job)?” Mishra asks, in his trademark simplicity. Another filmwala he’s had a long association with is Shah Rukh Khan, whom he’s known since before SRK became a star. “During his first production Phir Bhi Dil Hai Hindustani, he wanted me for a scene. I was busy with the World Cup and tried to wriggle out. But he was insistent. My scene is at the start of the film when he is introduced (Mishra plays the bomb disposal expert). He has a different energy, that’s why he is Shah Rukh Khan,” the actor says. Mishra also doffs his hat to director Subhash Kapoor. “When he narrated Phas Gaya Re Obama, I told him you should offer it to Naseeruddin Shah. Why me? Either your kismet is bad, or mine is going to be good. It was not my school of acting, it was very different. I got a lot of creative satisfaction from this film. “I worked in his film Jolly LLB for free. It was just a night’s work. We laughed till we died during the shooting. It was such a cute character!” Ram Gopal Varma, Mishra’s superb cameo in Jolly LLB, is creepy, corrupt cop you won’t forget easily. He did Dum Laga Ke Haisha for his mother, as it was shot in Haridwar while Masaan, shot in Banaras, was dedicated to his father. “After each film that we make, we kill the characters and I feel so sad about that. For example, I worked in Phas Gaya Re Obama for a month and kept my character alive. After the shooting is over, you kill the character and move on to your next film. Yes, the character will be alive on DVD but, as an actor, it’s gone. I won’t live it again. I recently finished shooting for a Telugu film called Kick 2. I was driving in Uttaranchal and listening to the music of Kick 2 and I felt like crying, thinking about the fun days of shooting. It was a good character and had become a friend of mine. But the shooting got over and I had to leave it,” Mishra says. “After Kick 2, I felt very proud of myself, much more than I felt after Ankhon Dekhi, because I did in film in a language I did not know,” he says. Mishra is currently working in the sequel to Phas Gaya Re Obama, Dilwale, Sooraj Bharjatya’s Prem Ratan Dhan Payo, Rajkumar Santoshi’s assistant Manish’s first film and Inder Kumar’s Grand Masti sequel. Movies, incidentally, are not his only love. Mishra loves cooking as well! In fact, his tastefully-decorated ‘sitting area,’ as he describes it (it’s a fully furnished flat in the floor below his home in Mumbai’s posh sea-facing Versova suburb), he has made sure there is a well-equipped kitchenette. His signature dishes are Achari Mutton and Pepper Chicken. 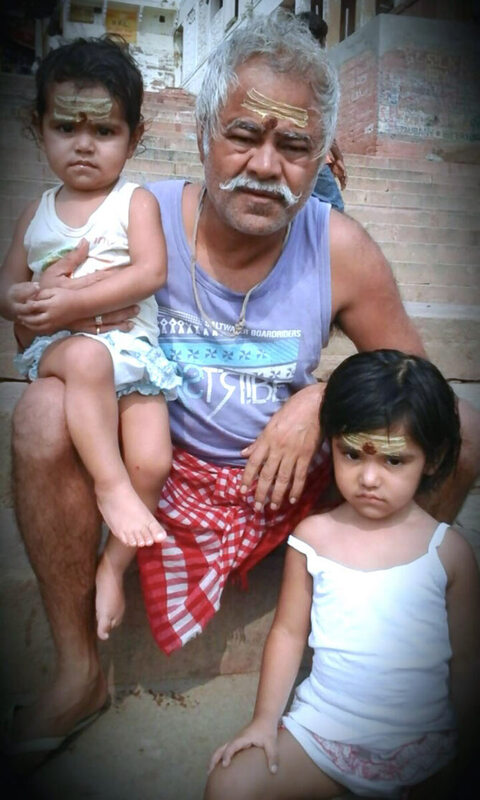 Mishra cooks at home too but, at the moment, refuses to cook for his little daughters, Pal, five, and Lamha, two. “I will cook for my kids when they grow up. Right now, all they want is jam-roti! Aapke khane ki issat honi chaiye bhale woh apne bachche kyun na ho (People should respect what you cook, even if they are children),” he says with a straight face. He also enjoys all kinds of music. “After 20 years, I don’t have a bank balance but I have a music balance,” he says. He has a gramophone player, with Pink Floyd and the Roti Kapda Aur Makaan soundtrack LP records. As if to prove it, the sun shines into the room just then, through the tinted windows, and lights up a yellow wall. Mishra admires the beautiful lighting, picks up his camera and starts clicking away. His favourite subject, as witnessed by the photographs on his walls, are sadhus! 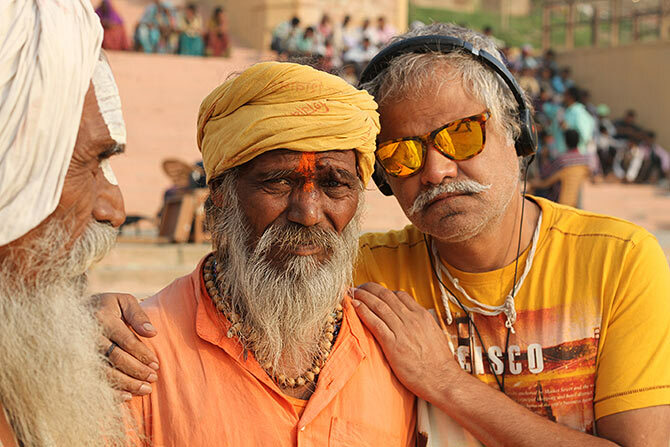 His wallpaper, on his computer, is a picture of himself posing with a sadhu in Banaras during the shooting of Masaan. 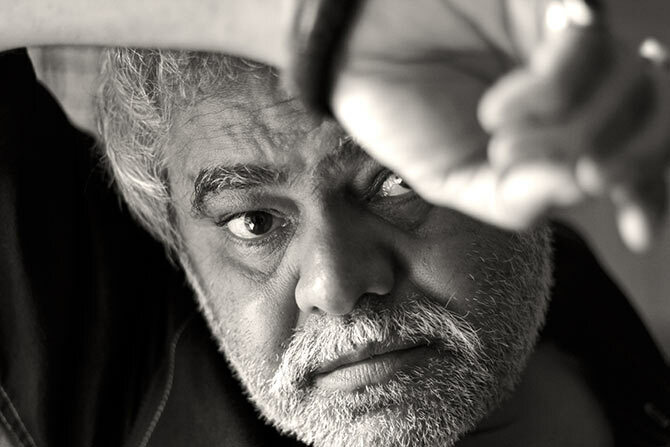 What Sanjay Mishra doesn’t care about is fitness. “Vidhut Jamwal does a lot for his body. He takes his body very seriously. I don’t,” he smiles, pointing to the cushions lying on his treadmill. Sanjay Mishra’s forte is comedy but there was a time when life didn’t seem funny. The actor was critically ill at one point during the shooting of the Office Office movie. He was in Patna at the time. “My stomach was hurting and I was hospitalised. They removed 15 litres of pus from my stomach. One tends to eat anything during shoots and my stomach was affected. My father was very worried that I couldn’t shoot because filmmaking involves a lot of money. He would take me for walks to help me recover. Once, a dean of a Patna hospital came to me and said his wife, who was also hospitalised, wanted to meet me. I was in a bad shape but I went anyway. He told her, ‘Dekho kaun aaya hai (See who’s here)’. She turned and looked at me and smiled. She was on her deathbed. I felt so blessed -- there was a lady on her death bed and she wanted to meet me. It was a better feeling than winning all the Oscars of the world,” he says. Ironically, 15 days after he recovered, his father passed away. “I was shattered,” Mishra says. “I could not go back to Mumbai. I wanted to be alone, so I went to Rishikesh and started working in a dhaba, making omelettes. The Sardar who owned the dhaba did not recognise me. But costumers would see me and ask, “Golmaal mein aap hi the na (Weren’t you in Golmaal)?” Then, they would want a photograph with me. Finally, the Sardar asked me who I was. Someone had told him I was an actor. It was Rohit Shetty coaxed Mishra to return and act in All The Best. “During the shooting, I would cry in my van very often because I would miss my father,” Mishra says. The second thing was, "Get married." Mishra, who was scarred by a failed marriage during his NSD days, wasn’t sure. But he started feeling lonely after his father’s death, so he agreed to an arranged marriage in 2009. He recently spent nine days in Uttarakhand, his wife’s Kiran’s hometown, with his family. “I cleaned potty for nine days!” he exclaims. “When I’m shooting, my wife sends pictures of what the kids are doing at the moment. During the holidays, my family accompanies me to my outdoor stints. Now, Pal knows the difference between ‘shooting’ and ‘dubbing’. ‘Shooting’ means her father will be gone for a long time. ‘Dubbing’ means he’ll be back for lunch!” he laughs. His trademark laugh transports us back to his comical scenes in his movies. Yes, there must be a television channel playing a Sanjay Mishra movie right now.